I am planning to walk the West Highland way anytime between Spring & Autumn, preferably Sept.
Can anyone advise the best time to avoid the dreaded Midges,please? Having walk through Scotland before I know just how nasty they can be. Hi @Vince. This will be a wonderful walk! In general midges are much worse in Spring and Summer. Therefore, September would be your best bet. Bear in mind though that September can often be quite mild and if you get the odd mild, humid day you will still experience some midges so best still to bring the repellent! I recommend Avon Skin So Soft! I recommend Jungle for midges. Hey Vince, when I was 17 we did the WHW in May time. We wild camped. The midge wasn't too bad at that time. I've walked the west highland way three times and hope to make it four soon. The midge likes warm muggy weather so best to avoid July august time but really once your past loch Lomond they become less of a problem anyway. Having checked a few walking site's they all seem to recommend the Avon cream. September or October would be a great time to do it as in October you'll start to see the Autumn colours starting. Its a great walk and you'll really enjoy it. I have tried Avon Skin so Soft and it did not work! Hi @Vince September should be ok as they're at their most annoying in summer. Avon Skin So Soft as mentioned above really works for me. As does the anti-midge spray made by Pyramid Travel Products - company based in the Scottish Borders. If you do go in spring or summer make sure you have a tick remover too and know how to use it. They're the other curse of the Scottish great outdoors. Thankfully like midgies they're easy to deal with if you have the right tools in your arsenal. . The WWW is a fabulous route and the scenery especially around the Devils Staircase and the Kinlochleven to Fort William section is beautiful. Walking the WHW in May. Only have 4/5 days. What is a good section to walk in a limited time? You can do the whole thing in 5 days. Hi @prideers! Perhaps you could start off in Drymen and this would miss out the first section of the Way from Milngavie which, although nice, is not just as spectacular as the rest of the route! 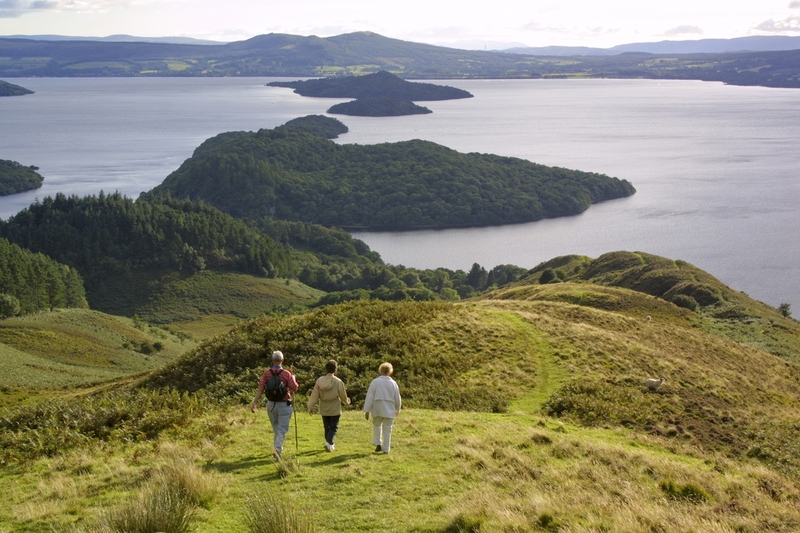 I must admit that I have not completed the whole West Highland Way, although the section between Drymen and Balmaha over the Conic Hill takes in some absolutely stunning views of Loch Lomond. It's also on the Highland Boundary Faultine - where the highlands of Scotland meet the lowlands. It's just amazing! © Loch Lomond and The Trossachs National Park, all rights reserved. I have mountain biked the northern half, from Crianlarich to Fort William over 2 days, so you could probably walk it in 4. It takes in Rannoch Moor, Glencoe, the Devil's Staircase and Glen Nevis and is a more open section, whereas the southern half, while still beautiful along Loch Lomond, is more wooded. If you are very fit you could probably do the whole route in 5 days! In late May there is plenty of daylight.